Double your pleasure? First a double barreled .45 and now this! "A new Israeli assault rifle features a twin barrel – the first such gun to be made in Israel." Silver Shadow, the firm that manufactures the Gilboa assault rifle, will soon unveil a new member of the Gilboa family with a double barrel, meaningfully increasing fire power and enhancing the effect of a hit on target. The gun uses standard ammunition. 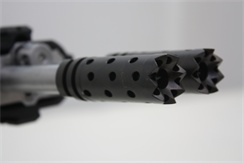 The new weapon will be presented by the company at the Eurosatory 2012 weapons trade show, to be held in June in Paris. The exhibit is one of the largest of its kind, and is held every two years. The Israeli booth at Eurosatory is regularly one of the main attractions at the fair. The weapon and its capabilities will be fully exposed in the eighth issue of Israel Defense, which will soon hit the stands. It's like shaving razors. First there were 2 blades, then 3 blades and soon 17 blades for maximum effectiveness! What do you think? Thanks to Israel National News.com. Now with more ammo and magazines to carry around!